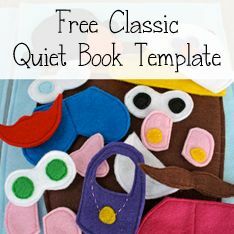 Today's quiet book is so cute and it looks so fun to play with. 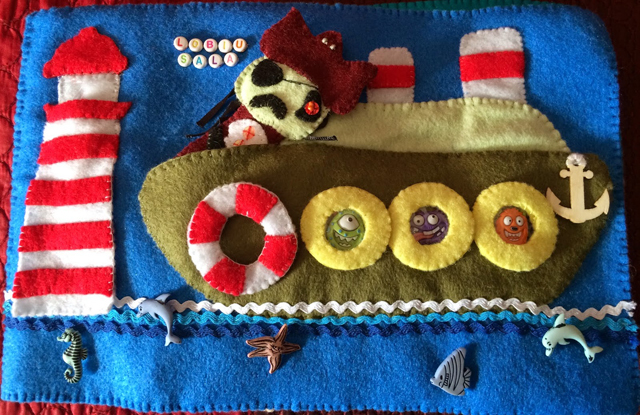 Made by Paula for her two children, this book has lots of great activities for children to play with. Even the cover has an activity - a mailbox with a flag that goes up and down, and that opens to show letters inside that can be taken out. The cover also has a buckle to keep the pages shut, which is a smart way to keep everything together. Paula says that her favorite page is her fridge and place setting, and I have to say, I love that page too. Her refrigerator design is so clever, cute, and easy. The food (sandwich materials) that go inside are adorable, and make me want to put together a felt sandwich right now. It looks so fun! I also like her barn and farm page, and like how she combined the apple tree and farm pages from the original template. I think it's a definite improvement, and looks really cute. Her cute music pages finish off the book, both of which are unique and fun! My name is Paula and I am a full time working mother of 2 children. I made the quite book for my almost 5-year-old son and almost 2-year-old daughter. I wasn’t sure if I could commit to making two books so I had to try to make it appropriate for both of my children. Beginner / Intermediate. I have always been into crafts but only really been interested in sewing for the past 6 months. 3 weeks. 2 to 4 hours a day on most days. 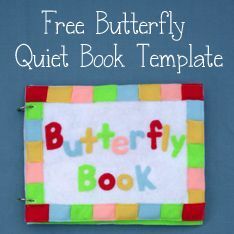 I used mostly templates and inspiration from this blog (The Quiet Book Blog) and Pinterest. Mailbox on the cover: Template - Imagine Our Life: Mailbox & Letters Quiet Book Page. Shapes and Music Pages: Inspiration from Pinterest but my own templates. Sewed it on the sewing machine. The book was made from cotton and batting on each page. 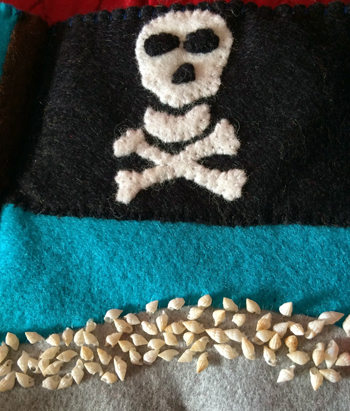 For most pages there is a full sheet of felt sewed to the cotton and batting backing. A buckle to close the book, snaps, and velcro. About $40 to $50 but I have a lot of supplies left over. I like the refrigerator and place setting with sandwich. I think that is one of the pages that I can add to as I think of different things. Paula, thank you so much for sharing your awesome quiet book with us! 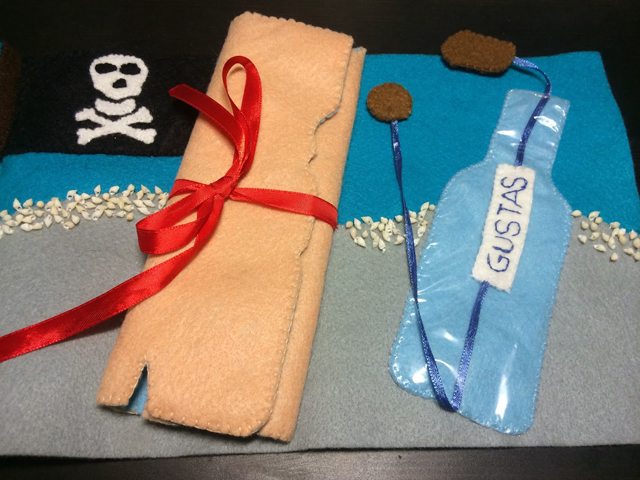 Today's post is special because we've never had a quiet book presented like this before. Clara from the blog Claras Nahkiste, instead of taking pictures of her quiet book, has made this video where she walks through the book and shows all of the interactive things that it does. Clara's quiet book is huge and awesome. She has so many pages, and all of them look so fun to play with. Her video shows a clever cover and binding rings, a dress up page full of little clothes, a name page with moveable letters, a laundry page with socks that can go in a washing machine, an "I Spy" page with a removable bag full of things to find, a fruit-picking tree page (with multiple kinds of fruits and baskets, a weather and flower page, a farm page (with adorable finger puppets - sooo cute), an igloo page with ice building blocks and snow characters, a car page with a big map of the town, an elephant with a tail you can braid, a camping page with a zipper tent, a clock page with moveable hands, and a mailbox with letters inside. Each page has more detail than I've summed up here, that's shown in the video. This book would be such a treasure to have as a child! My name is Clara, I'm 23 and I'm a crazy, sewing, Berlin teacher-to-be. I made this book for my niece and godchild Sophie for her third birthday. I sew for more than three years now and I think I'm advanced. 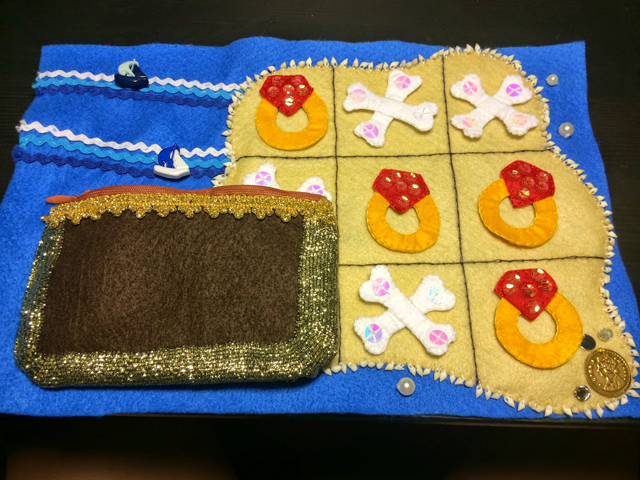 I sew it over three weeks, in my semester break, all in all it took 66 hours. 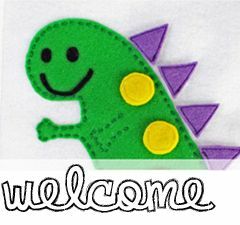 I used some templates from this blog and many inspirations from Pinterest. 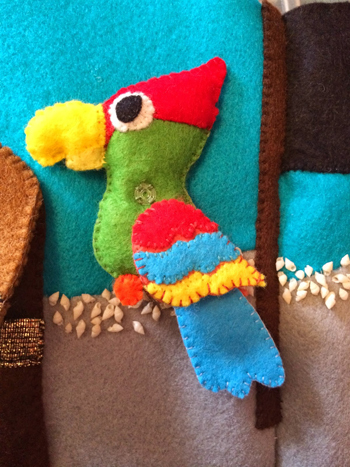 They all are made of cotton fabric in different colors, many details are made out of felt. Felt, as mentioned and something that's called Vliesofix in Germany. 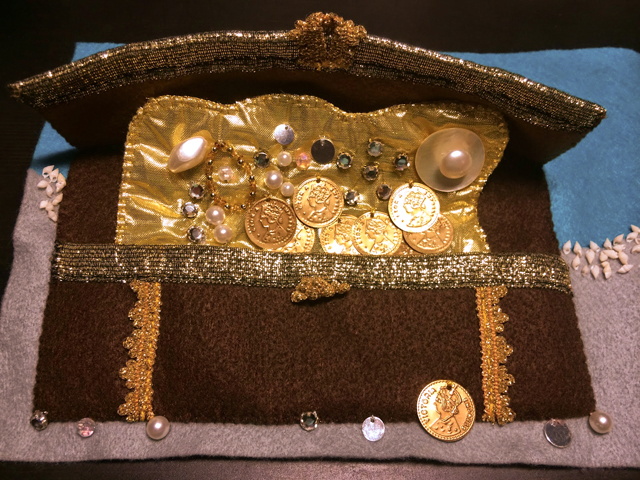 It's used to make appliqués. Because I bought nearly no fabric, the costs were small. I think about 30€. To see Clara's quiet book on her own blog with some pictures and explanation of the book, click here: Claras Nahkiste: Quietbook Zum 3. Geburtstag. Clara, thank you so much for sharing your wonderful quiet book with us! 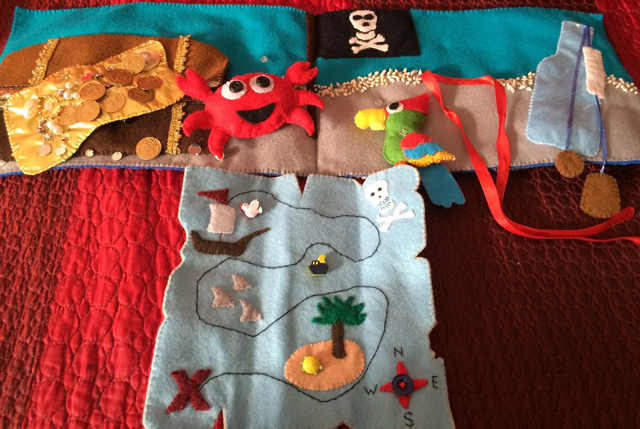 I am so excited about the incredibly cute "Treasure Island" quiet book that I get to share with you today. 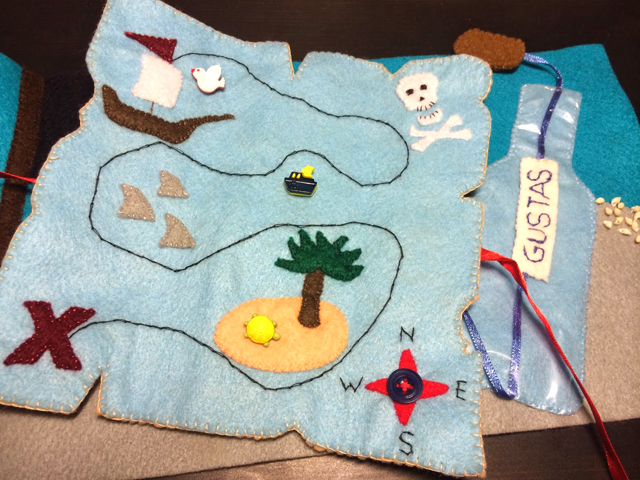 Made by Džiuginta of the blog Domus Feltinis, this detailed book includes a pirate ship cover (complete with light-up lighthouse), a pirate finger puppet, a treasure chest with a lock and filled with treasure, a parrot, a crab, a Jolly Roger pirate flag, seashells on the beach, a treasure map, a letter in a bottle, and a rings and crosses tic-tac-toe. It's incredible. Each page has so much to do and so much to play with. I love the decorative details on each page, too - especially the rick rack waves and the little seashells sewn to the page. (LOVE the seashells.) I also thought Džiuginta's way of lighting up the lighthouse was very clever - she put a tiny push flashlight (the kind that go on key rings) inside. 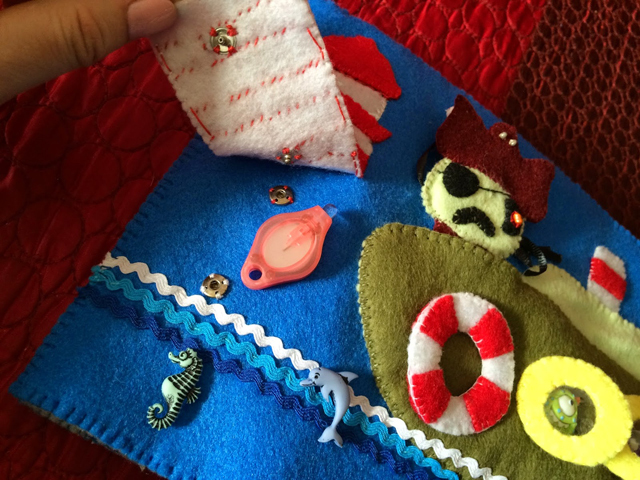 Please, enjoy Džiuginta's quiet book and also the rest of the cute crafts on her blog! My name is Džiuginta. 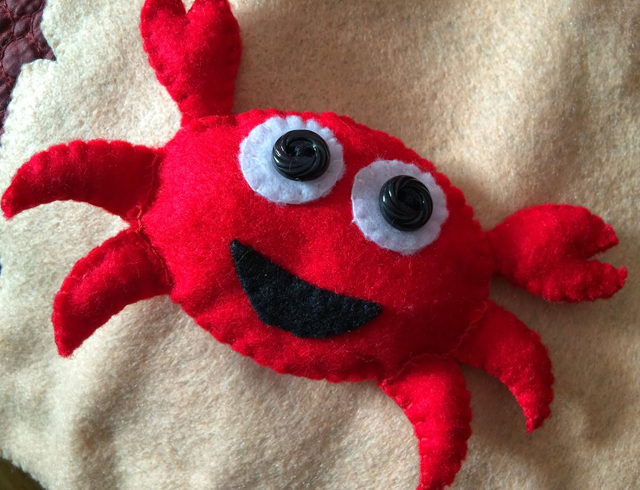 I am a big dreamer from Lithuania, obsessed with felt crafts! I made this quiet book for my 3-year-old son. I'd say intermediate but I only hand-sew. I am not sure how many hours it took but I worked on it for about a month - one full weekend and whenever I had a couple of hours to spare. 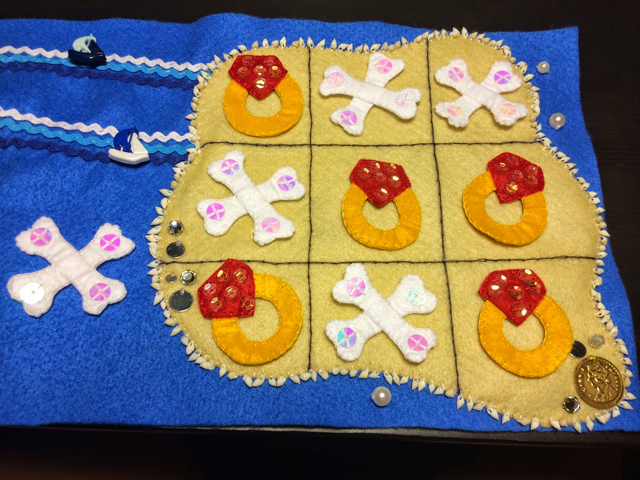 I used Treasure and Pirate Island Tic-Tac-Toe templates from the Imagine Our Life blog and some coloring pages as an inspiration for the lighthouse and the ship. 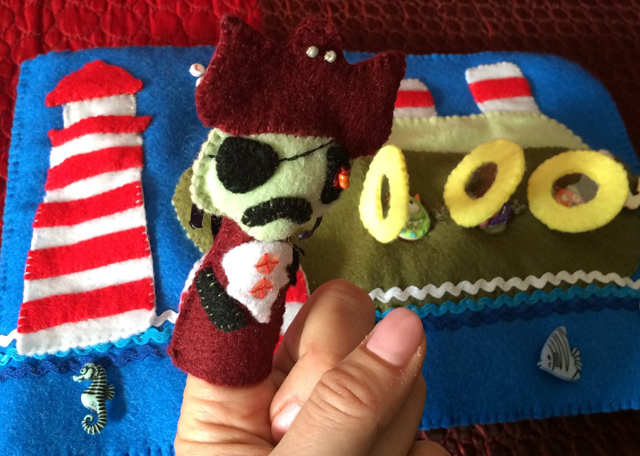 The Pirate finger puppet was inspired by a Pirate zombie from the Zombie Felties book. I added some details like the removable crab and parrot for which I made templates myself according to some pictures found on the Internet. The pages are stitched together by hand. 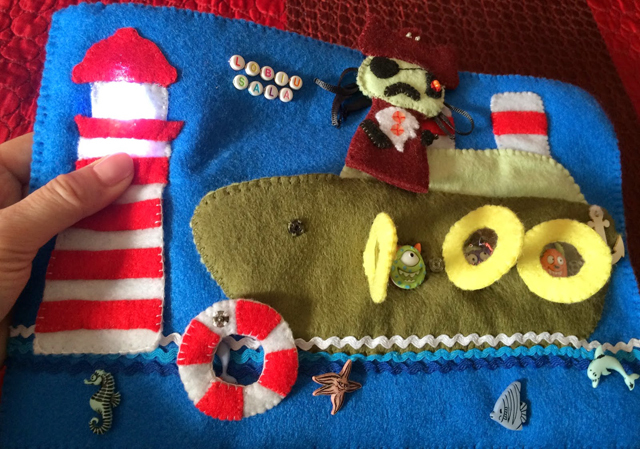 The pages are made out of synthetic felt. I love the whole book but the front page must be my favorite as I created it from scratch. 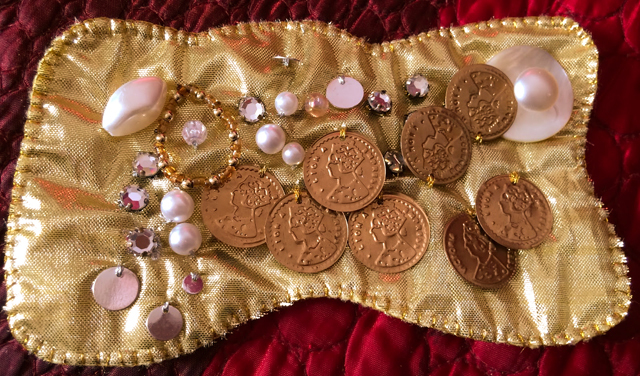 To view Džiuginta's treasure quiet book on her own blog with more explanations of each page, click here: Domus Feltinis: Treasure Island Quiet Book. Džiuginta, thank you so much for sharing your wonderful quiet book with us!